Mobile concrete batching plant is specially used in the project with short construction time, long construction line, frequently changing construction site; mobile concrete plant is also called small concrete batching plant because it is small in size. The well-sold portable concrete batching plant in our company has the following features: compact in structure, small in space needed, simple in installation, high in automation. It is widely used in the construction of bridge, building, water conservancy project, power and other infrastructure. Adopting the horizontal double-shaft compulsory concrete mixer, it can mix the aggregates strongly, evenly and effectively. Its lubricating system is thick oil pump that can be operated manually. The external shaft bearing is easy to repair and replace. The mixing blade and lining board are made of high chromium and manganese wear-resistant alloy which ensures the mixer’s performance and long service life. 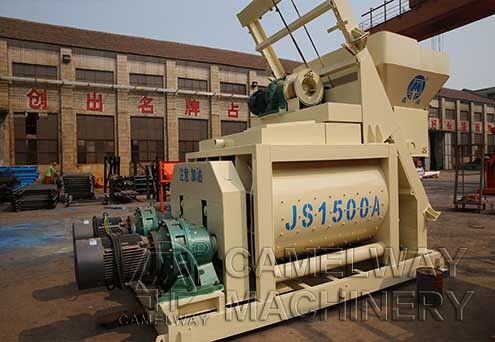 Zhengzhou CamelWay Machinery manufacture develops and produces concrete mixing equipment which will satisfy your different requirements. Welcome to contact us at any time. This entry was posted in Indonesia Batching plant, Solution and tagged Concrete Batching Plant by camelway. Bookmark the permalink.